Hi everyone! 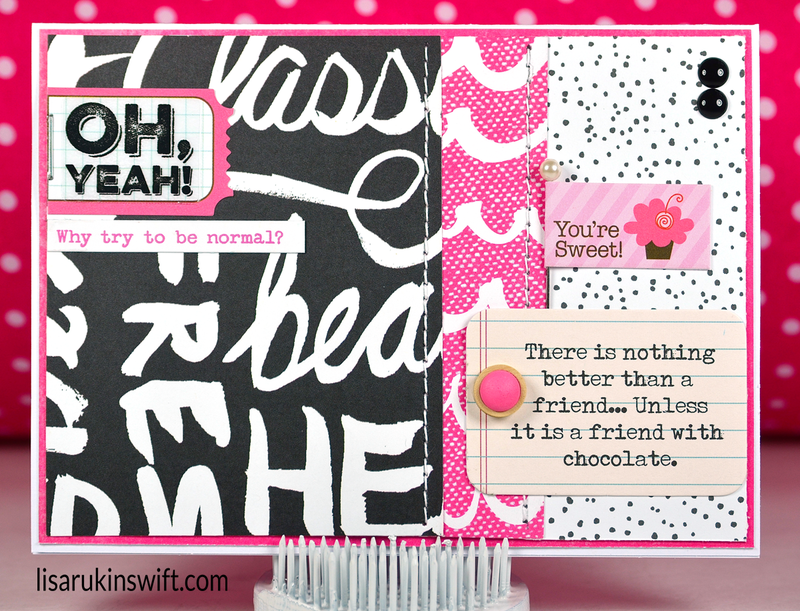 Today I'm actually sharing a layout. Can you believe it? I've been on such a card kick lately because my usual photo subject has been camera shy (but she doesn't mind taking pictures of her cat). So photo credit goes to Alexa and a big thank you goes to Butterscotch for being such a cooperative model. I recently got the Elle's Studio Cienna collection from Paper Issues and it worked perfectly with this photo. Using a black and white photo allowed me to add in all of the gorgeous colors in this collection. Even though Butterscotch is a boy, I don't think he'll mind that I used girly colors to scrapbook a page about him. At least I hope not. LOL! This was actually the first time I've ever used an Elle's Studio collection but I know it won't be the last. Do you have a favorite Elle's Studio collection? What is it? Teacher Appreciation Week is next week so I made cards for Alexa to give to her favorite teachers. I created the card above for her female teachers, using Webster's Pages Hall Pass. I created the card below for her male teachers, using an old collection from Cosmo Cricket, called The Boyfriend. Does anyone remember this collection? I've kept it on hand all these years because it's perfect for school-themed projects and you can use it for younger kids and older ones alike. 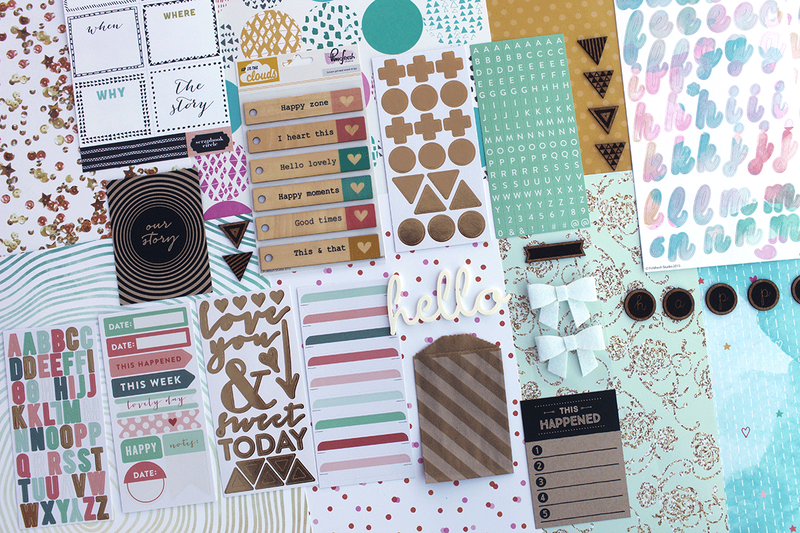 Chalk One Up to Your Own Style is the new linky party happening over at Paper Issues. 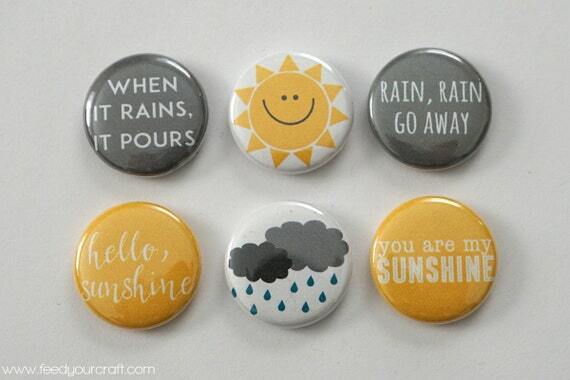 There are so many ways to interpret this theme (and you'll find them all listed on the Paper Issues blog). I went with the chalk part of the theme by using black chalkboard paper as my background. I also surrounded a black and white sentiment with a wood veneer frame to give it the look of a chalkboard. Some of you may have noticed the new banner in the sidebar of my blog. If you've been wondering what it's all about, I'm here to tell you about my new Etsy shop, The Card Kiosk. You'll find creations which have been posted on my blog at one time or another and you'll see some new ones as well. All of them are handmade by me and one-of-a-kind. There are baby cards, birthday cards, love-themed cards, friendship cards, seasonal cards and much more. I plan to add to the shop on a regular basis. So, I hope you'll stop by, favorite The Card Kiosk and poke around a bit. :) Thank you! 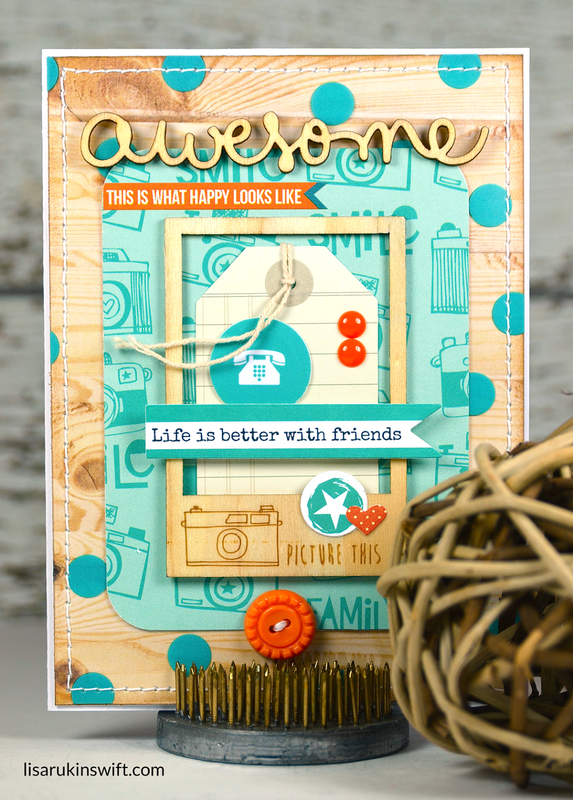 This is another card I created for Corri Garza's color challenge during last month's Paper Issues crop. I was so inspired by the color combo Corri chose. As with yesterday's card, I relied on my trusty Paper Issues Swag Bags and items from my stash, including a Bella Blvd. polka dotted Clear Cut Transparency. Yesterday I used a white transparency, today's card showcases turquoise. I've been told this is a very soothing card. I think it's because the light woodgrain paper allows the other elements to stand out, plus it complements the other wood embellishments. What do you think? 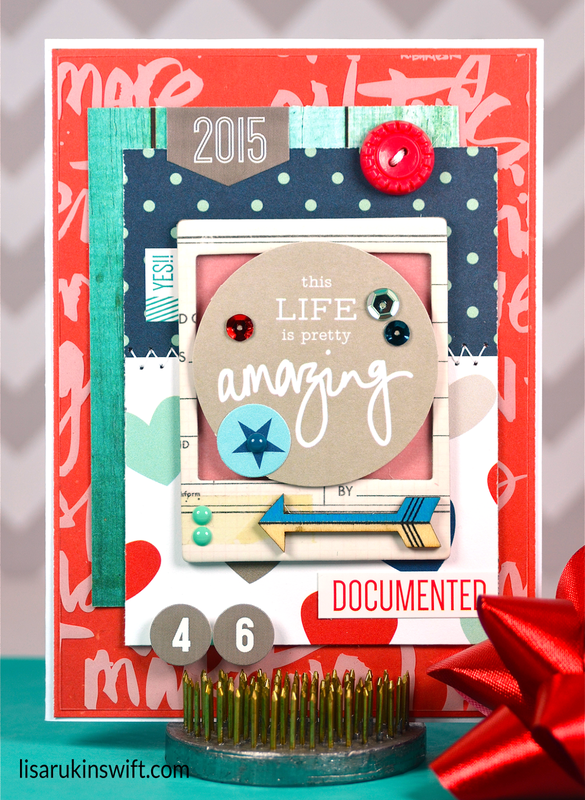 I created this card for Corri Garza's color challenge during last month's Paper Issues crop. It was fast-paced, crazy and so much fun. I pulled this together using various Paper Issues Swag Bags and items from my stash, including a Bella Blvd. polka dotted Clear Cut Transparency. I bought them in a number of colors and love them so much. They can turn a paper with a subtle pattern (or no pattern at all) into something fun and whimsical. 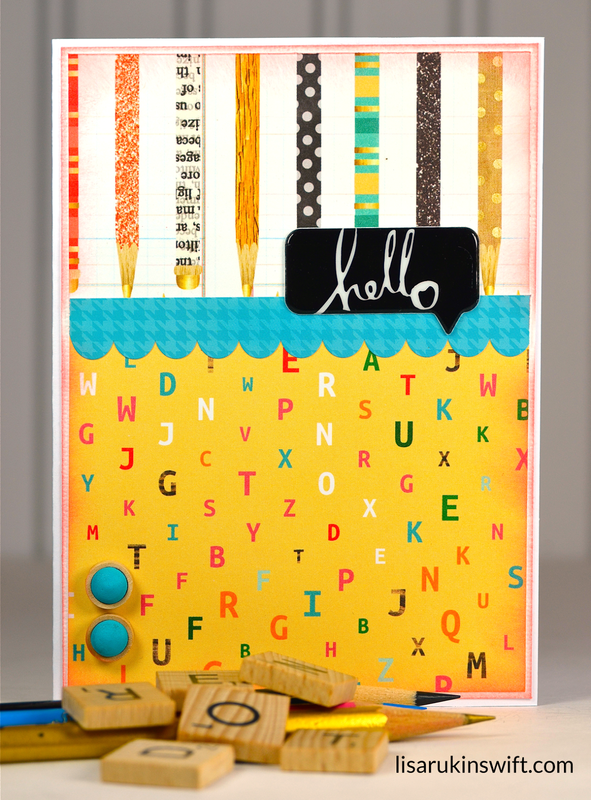 Do you use transparencies on your projects? Do you have a favorite? I've added quite a few to my stash lately, along with some new printed vellums which I've been putting to use. I put together a pocket page (not something I do often) about Alexa's 13th birthday. 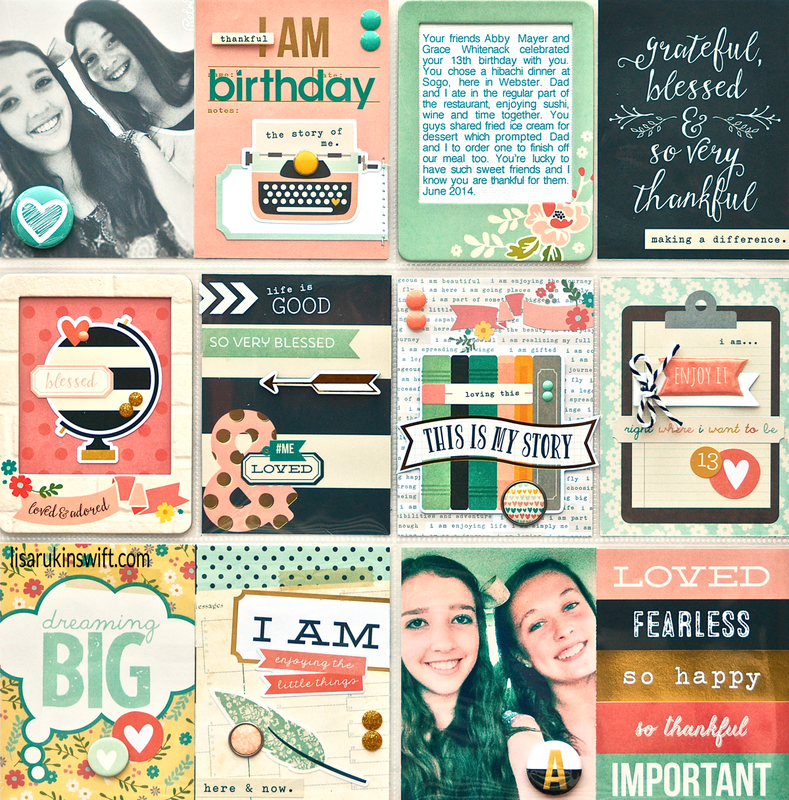 Simple Stories I Am collection made it easy to create using just one sheet of 3x4 papers paired with 3x4 photos. Even the chipboard frames (which are on the outside of the page protector) worked with the other 3x4 elements. Other than that, I used stickers, chipboard pieces, die cuts, bradz (Simple Stories version of brads, minus the prongs), flair and a couple of embellishments from my beloved Paper Issues Swag Bags. This came together in flash. I can't believe Alexa's 14th birthday will be here in a matter of months AND I'll have a high schooler on my hands! I took the modern vintage (is that an oxymoron, LOL?) approach with this card. I chose the Jillibean Soup mini flash card first and worked the rest of the card around it. I love the saying on the flash card and knew it would be perfect for Alexa's 14th birthday. After that, I dug into my trusty Paper Issues Swag Bags, put a couple of coordinating 3x4 papers together, added in some embellishments, and called it done. You never know what little gems you'll find when you ask your almost fourteen year old to show you her phone photos. It's fun to see her perspective on things — selfies, photos of her with her friends and hundreds of photos of her cat. This photo allowed me to document what Alexa's doing in her life right now — what she loves, what she's accomplishing, what her plans are for going into high school next year, etc. A new issue started today at Paper Issues. 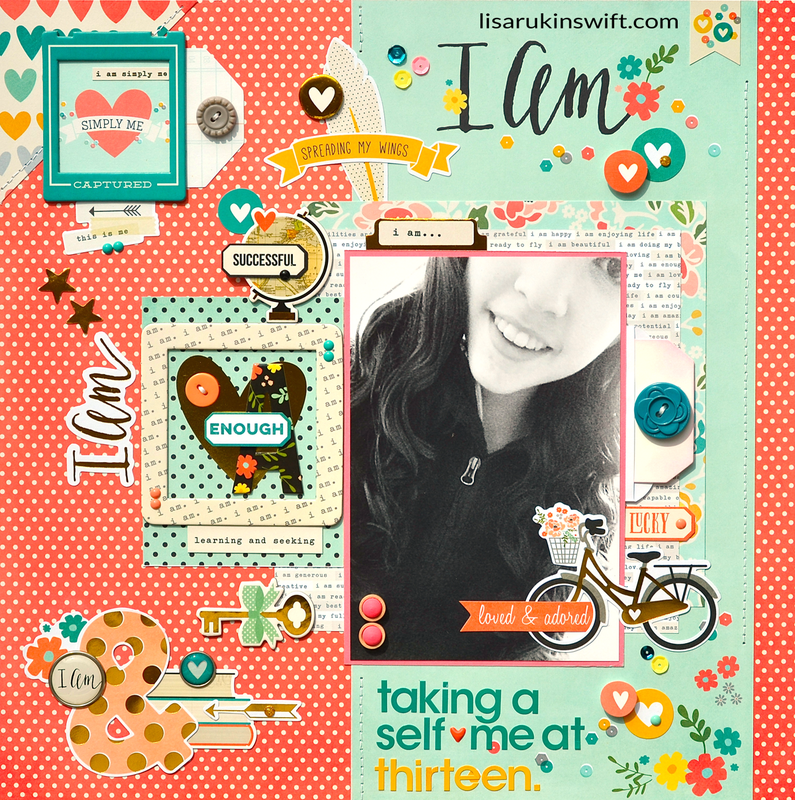 It's called Prints Charming's Beautiful Papers, sponsored by Scrapbook Circle. 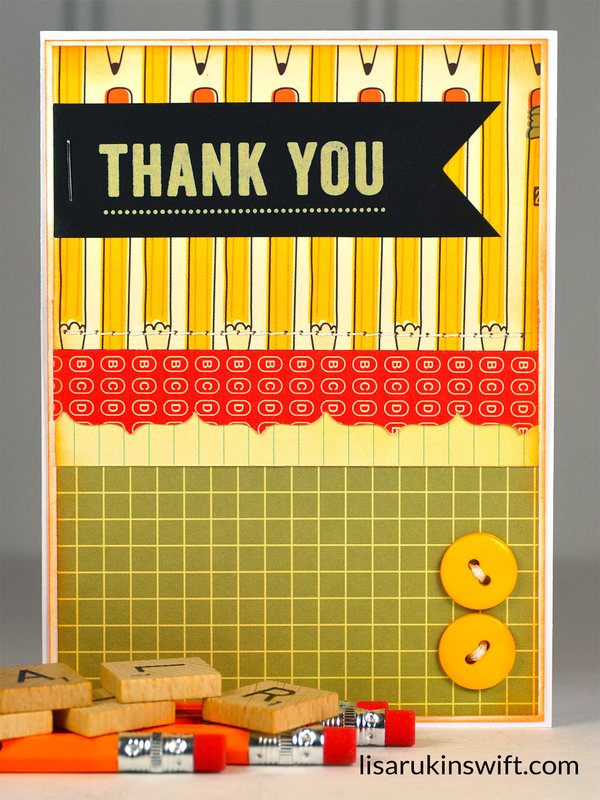 To create my card, I layered a Bella Blvd. polka dot transparency over a scrap of My Little Shoebox paper from my stash. I adhered two 3x4 papers from the Paper Issues March Swag Bag on top of the transparency and then added the embellishments. Hi everyone! Happy Friday! 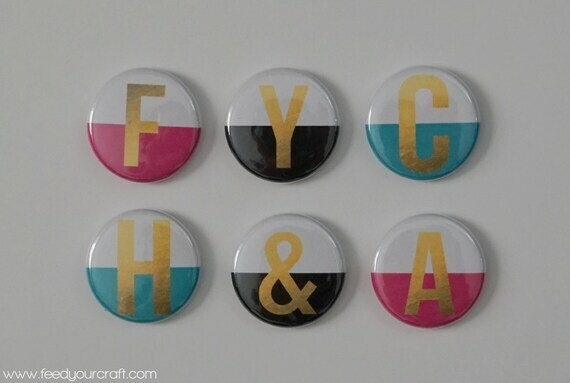 I'm doing something today I haven't done in a while — guest designing for Feed Your Craft, an Etsy shop that sells mini flair badges and other handmade paper crafting items. I happen to adore Feed Your Craft's flair. 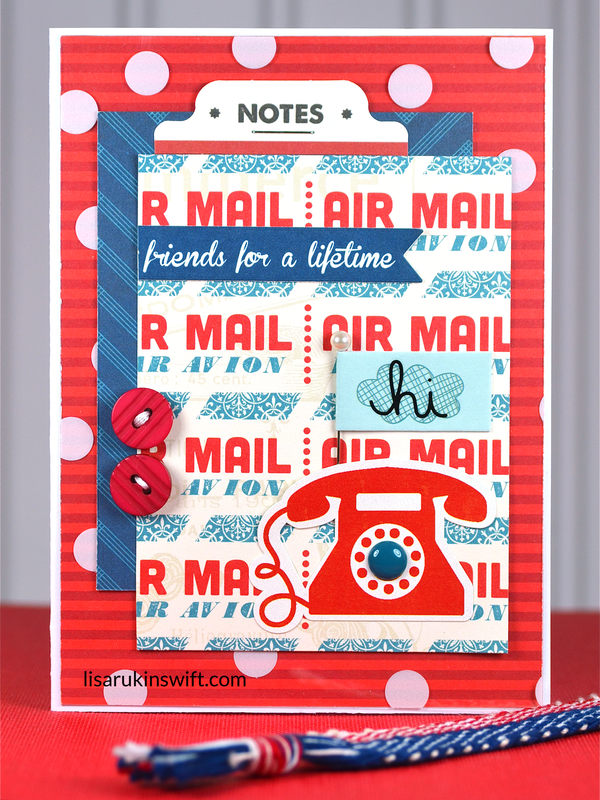 It's on the smaller size, 7/8", so it's perfect for small spaces, like cards. 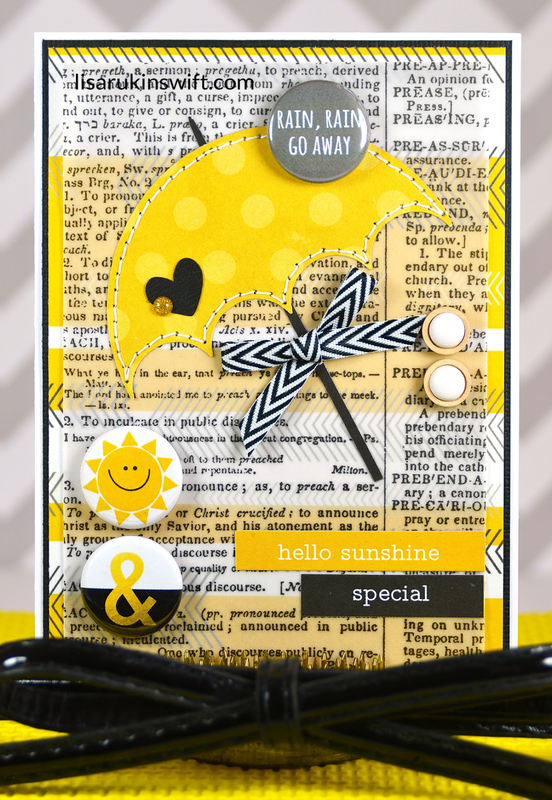 As you can see, I worked three pieces onto this 4 x 5 1/2" card — two pieces from the adorable Sun & Rain Mini Flair Badge Set and one piece from the fabulous Gold Letter Dip Dyed Mini Flair Badge Set (which you can have customized with any letter or symbol in your choice of three different colors). 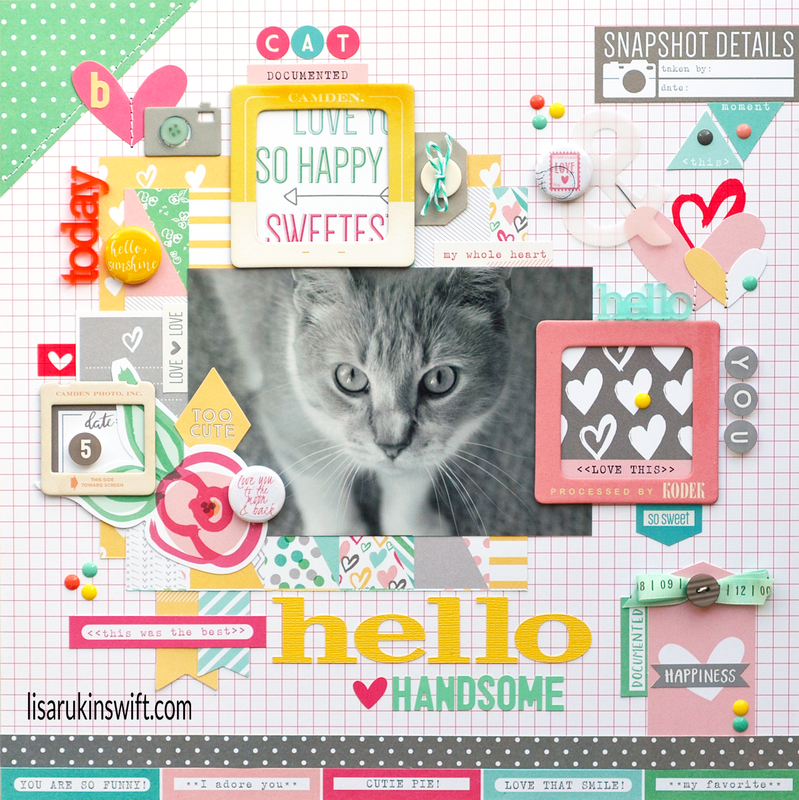 If you love what you see as much as I do, pop on over and check out all of the wonderful products available at Feed Your Craft, including the 50/50 mix which allows you to choose three pieces of flair from one set and three from a second set and you'll see a number of new sets added today. Elise is so easy to work with, makes a quality product and has very reasonable shipping costs. 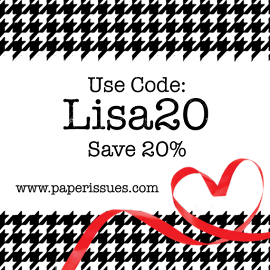 She's even given me a discount code to share with my blog readers: LISA20 will take 20% off of your order through midnight EDT on Sunday, April 12th. One of my friends celebrated her 46th birthday a few weeks ago, so I put this card together using papers from various Paper Issues Swag Bags and items from my stash. 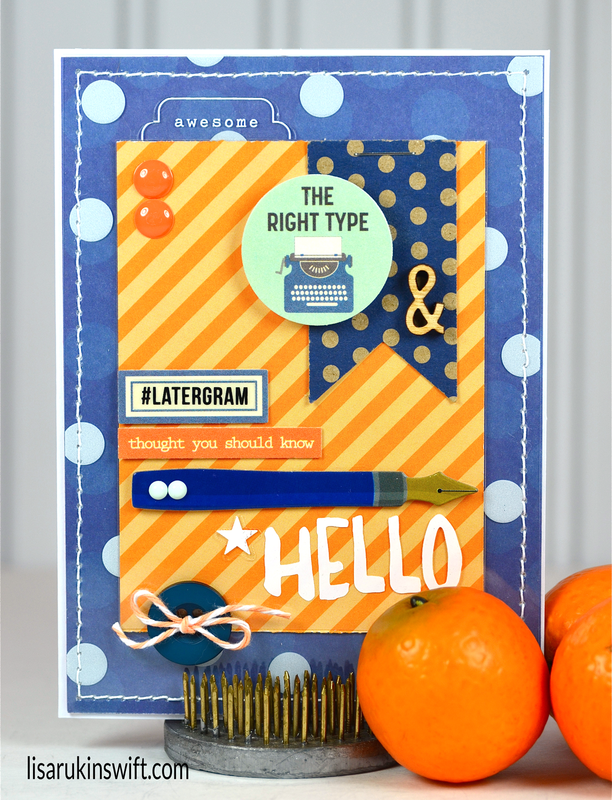 I can tell you there's nothing better than a daughter who loves to check out all of my Swag Bag goodies and put the papers into combos I can use to make cards (like she did for this one). Maybe I should pay her...in chocolate. LOL! I have a feeling she'd like that. I pulled the colors for this card from the heart paper, focusing on the pink and yellow, but adding in some orange and blue as well. I used three 3x4 papers (all Gossamer Blue) from various Paper Issues Swag Bags, along with items from my stash, like the wood veneer dots from Pinkfresh Studio and Feed Your Craft flair. I love mixing the old in with the new. Makes me feel as if I'm actually making progress in using up my stash. LOL!